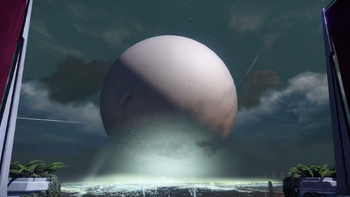 The Traveler is a mysterious spherical entity floating above Earth. Massive in scale, it hangs motionless in the skies above the Last City built in its shadow. Throughout the events of Destiny the Traveler remained comatose despite the Guardians' efforts at reviving it. During the Age of Triumph it seemed to get stronger as Guardians were noted to be more powerful than before. Nonetheless it was captured at the start of Destiny 2 by the Cabal Red Legion and taken from humanity, weakening Guardians severely, only to reawaken after countless millennia to smite its leader Dominus Ghaul and putting an end to the Red War. "The Gardener is hard to bother; she is constantly amidst her weeds, kneeling in the tangent dust, gloves covered in a mix of distant soils and metallic saps. She is listening to the music of the insects amidst the flowers, the unguent as it begins to drip from the ferns, the slight scratch of the Worm beneath, and not to you, and certainly not to your cries for help." The Traveler is an ancient and immensely powerful machine, and the source of Ghosts and the paracausal powers of the Guardians. It is a source of Light, though not the only source in the universe. Its outer surface is made of Neutronium and "Electroweak matter", both hypothetical materials; the former is believed to make up Neutron Stars, and the latter is based on a fundamental force that hasn't existed since the dawn of time. The origins or nature of the Traveler is not clear to anyone. However, some information can be gleaned from the poem known as Dreams of Alpha Lupi. Based on this work, it appears that the Traveler chose Earth and humanity for a reason; it detected a "face" emerging from the Sun, later hearing a roar that contained something that it described as "a lucid melody". The Traveler felt joy, as it felt "the first hope in ages transform [it]," and it resolved to become strong enough to fight the Darkness. The Traveler exists to help other worlds, but has never wished to be worshipped as a god, nor made its presence known any more than necessary to cultivate a civilization. When its work was finished, it would simply leave without fanfare. It would seem then that its defense of humanity was an extraordinary act under dire circumstances. Saint-14 suggested that the Traveler had previously visited other species before finding humanity. The Fallen civilization in particular once hosted the Traveler, which they named the Great Machine. However, it left their system around the time of the Whirlwind. Other than the likely involvement of the Hive, little is known about this event, though it is thought to be similar to humanity's Collapse. After the destruction of their homeworld, the Fallen went in search of the Great Machine, leading them to the Sol System. All of their previous conflicts with humanity have been attempts to claim the Traveler for themselves, in an effort to prevent the destruction of their race. Other species the Traveler has also uplifted include the Ammonites and the Harmony. The Cabal are aware of the Traveler's existence and nature, with some indications that they knew of it from other species. Ghaul in particular wants to receive the same power as the Guardians, believing himself to be more worthy. The Hive uniquely hold the Traveler in special contempt, as it embodies the antithesis of their culture and society. One of the objectives of their crusade is to hunt down and destroy the Traveler once and for all. The Traveler first came to human attention when it appeared around Jupiter and terraformed two of its moons. Initially dubbed "Moon X", it quickly became the center of international attention. After finishing its work on Jupiter, it vanished for fourteen months, reappeared to terraform Mercury, vanished again for seven months, and then appeared again to terraform Venus. Questions about the identity of Moon X abounded, and cults worshiping it emerged, some of which fell into conflict. Other cults held demonstrations calling for the unification of Earth's governments. When Moon X was detected approaching Mars, a mission to intercept it was hastily organized. Initially known as Project Catamaran, the effort was renamed Ares One on the day of launch. The name "Traveler" may have been coined by one of the crew members. By the time the ship landed on Mars, the Traveler had brought the first rain to the desert planet. It helped humanity expand across the solar system, teaching humans new technologies, helping them terraform planets and leading humanity into a Golden Age. "The knife had a million blades." Some time later, the Traveler's enemy, the Darkness, appeared in the solar system, leading to the destruction of almost all human civilization in an event known as the Collapse. For the first time, the Traveler decided to stand and fight the Darkness, as it abandoned its work on Io and raced to rescue its "children", humanity. At the end of the wars that terminated the Golden Age, the Traveler, in its sacrificial last gift to humanity, came to rest over a small area of the now wasted human planet. The Traveler lays dormant now, apparently stripped of its senses and "flesh" by the Darkness, made blind, deaf and mute to the outside world. As humanity struggled to rebuild itself from these events, the crippled object gifted its protection and powers to the recovering humans. Although the times after the war were difficult, humanity persevered and with the help of this celestial guardian, and the humans eventually began to re-explore their terrestrial and solar domain. In its last breath, the Traveler created the Ghosts, to seek out those who can wield its light as a weapon. The Ghosts revived fallen warriors as Guardians, protecting humanity when the Traveler no longer could. The remnants of humanity built the City beneath the resting place of the Traveler, where they were safe from the continuous onslaught of various alien races such as the Cabal and the Fallen. This city rests in the shade of the great sphere, built under its protective aura as a last bastion of humanity. The Guardians are destined to protect this city and its inhabitants, and as such are gifted with some of the magnificent powers of the Traveler. Some believe that the Traveler chose Earth for a reason, and it is humanity's obligation to prove itself worthy of its light. With the Darkness returning, humanity fears they will not be able to survive it this time. As a last ditch effort, the player is given the ultimate task of attempting to wake the Traveler before the Darkness arrives, in order to drive it back. The Guardians are able to help the Traveler slowly restore its light, first by stopping a Hive ritual in the Chamber of Night that is siphoning light from the Traveler, and then destroying the heart of the Black Garden. Two years after the Taken War, the Cabal Empire's Red Legion launched a major invasion of Earth headed by the Red Legion commander, Dominus Ghaul. A devastating surprise attack on the Last City was launched, trapping the Traveler in a cage to siphon off its light while separating it from the Guardian forces. Though trapped, the Traveler sent visions to the now lightless Guardians to seek out one of its fragments in the European Dead Zone, whereby they could regain their powers. Dominus Ghaul attempted and failed to win the Traveler's approval and make him into a Guardian, and simply took the light by force. When he gloated in front of the Traveler, the Traveler suddenly broke its cage and destroyed Ghaul, as well as slowly healing itself by drawing fragments back into itself. 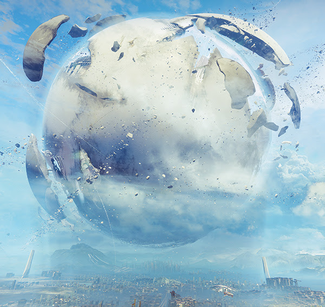 With the invasion ended and the city retaken, the Traveler was declared no longer dead but living once more. Despite having awoken, the Traveler has still remained hovering above the Last City and has not taken any direct action. However, Benedict 99-40 claims that the Traveler has been busy. A year after the Traveler woke, Ikora Rey revealed that the Traveler had been speaking to her and several other Guardians through visions since its awakening. Ikora then instructs Guardians to follow visions of light. Eventually, the visions lead the Guardians to Io, where the remnant light there grants them new abilities. "Traveler at 1 revolution per zenith." "Traveler declining 1 revolution per zenith." "Traveler exiting epicycle. Returning to main cycle." "Traveler at minimum valence. The Light persists." The Traveler is referred to by the Warmind Rasputin as "the Gardener" in various lore entries, alluding to its role in nurturing civilization. The Traveler first appeared in another Bungie game, Halo 3: ODST, where a hidden poster made it appear innocuously like the Moon. The Traveler's size has changed over the course of development. Early concept art depicts a Traveler the size of a small moon orbiting Earth, while its finalized appearance in the game shows it hovering much closer to Earth's surface, within the atmosphere, and roughly the size of the Last City. According to a Reddit post made on /r/DestinytheGame, players were able to determine the Traveler's in-game size (as seen from the Tower and Bannerfall) as 1.2 kilometres in radius. Destiny 2 concept art (see gallery) revealed that the Traveler's diameter is seemingly fourteen kilometers. According to Xûr, there is a dark mirror of the Traveler. The terms "Retrograde", "Zenith", "Epicycle" "Theta State" and "Valence" are used in tracking the Traveler's Light output. "Retrograde", "Zenith", "Epicycle" are astronomical terms. In astronomy, the zenith is the point at which something appears directly overhead relative to an object or observer. Epicycle is a former astronomical term which was once used to describe the motions of other planets, relative to Earth, but has since been disproven; however, it still finds use in astrology. It was based on the old "geocentric" belief that the heavens and all objects within it travelled around the Earth. Observers would often note that the planets seemed to slow and change their trajectories in the course of their passage across the night sky, appearing to trace loops in their orbits relative to the stars behind them. This led to the concept of an epicycle: or a smaller rotation of a planet around a barycenter in the course of its larger rotation around the Earth itself. The period in which a planet appeared to slow and descend into a loop, just prior to appearing to move backwards, was known as the declining or descending phase. The period during which the planet traced the bottom half of the loop, appearing to move in the opposite direction from its orbital path is known as the retrograde phase. "Equilibrium" denotes the point at which the planet ceases to move backwards and begins to ascend out of the loop and into its normal orbital path once again, denoting the end of that particular epicycle. This particular astronomical theory was eventually proven to be an optical illusion after Copernicus introduced the then-radical notion that the Earth was not the center of existence & that all planetary bodies within the solar system, including Earth, revolved around the Sun. Johannes Kepler later proved that the so-called "epicycles" were the result of the Earth's orbital position relative to that of the planet being observed. The term "Theta State" refers to a Theta Rhythm, which is an oscillatory pattern of brainwave activity in electroencephalography (EEG). This rhythm occurs within the human brain's hippocampal and neocortical regions at between 4 Hz. and 7 Hz. In both regions, these signals have been associated with transitioning from a dream-state to wakefulness, as well as a state of deep meditation. In chemistry, the "Valence" of an element is a measure of its ability to bond with other atoms when it forms chemical compounds or molecules. These terms are drawn from three different fields of science and the exact manner in which they apply to the Traveler's Light output is unclear at this time, save that they are used to indicate a repeating pattern. The Festival of the Lost features a mask of the Traveler that can be obtained by players, and which is worn by the Speaker for the duration of the event. The back of the mask is marked by the tricorn symbol worn by the Speaker and included in Destiny's logo. According to Fenchurch Everis, the inside of the Traveler "smells faintly of vanilla". Early designs for the Traveler's sphere. Originally an early concept of the City. The Traveler, captured by the Red Legion. A size comparison between the Traveler, The Immortal, and the Traveler Cage. This is the closest canonical size given for the Traveler. ↑ 6.0 6.1 " Gameinformer: What’s Going On In Destiny’s Story, Anyway? ↑ YouTube - Destiny 2 – “Gameplay Premiere Livestream (US)"